The iconic TV show Mr. Rogers’ Neighborhood always began with the man himself slipping out of his work shoes and sports coat and into the more home-appropriate cardigan and sneakers. 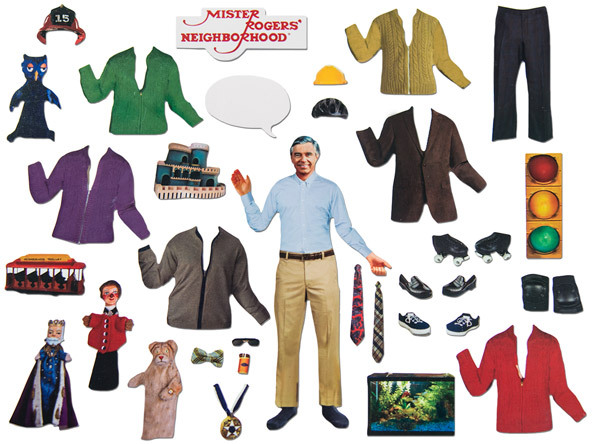 With Mister Rogers Dress-Up Magnets, you can pick the appropriate outfit for the famous PBS star. Play it safe with a range of cardigan options, or get wild and add roller skates, pads, and a helmet so Fred can cut loose. The set also comes with some of the characters from the Neighborhood of Make-Believe such as King Friday and Daniel Tiger. For a little extra fun, the set also includes a dry-erase speech bubble so you can honor some of Mr. Rogers’ most memorable quotes. Play with your friendly neighbor on the fridge, file cabinet, or desk and always remember that he’ll be back when the day is new. Make your fridge a friendly neighborhood! 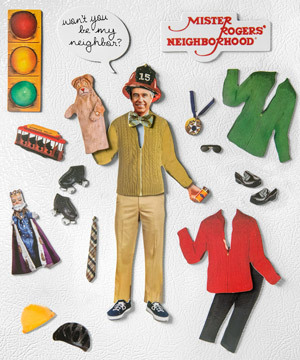 Transform your refrigerator into the cozy home of Mister Rogers and his friends from The Neighborhood of Make-Believe with Mister Rogers Dress-Up Magnets. Each day, Mr. Rogers will greet you in the outfit that you pick out for him. Just place the magnetic accessories on top of Fred’s body, and they will stick right to him. Of course, he wouldn’t be the PBS star he is today without one of his signature sweaters. The 35-piece magnet set has everything you need to take a trip down memory lane with Trolley and the gang. The iconic stoplight that hung in his home, the fish tank Mister Rogers lovingly took care of, and of course all of his outfits and characters are included. Question: Can I put these on something other than my refrigerator? Answer: Of course! The magnets will stick to most metal things like a filing cabinet. Question: Mr. Rogers sure had a strong sweater game! Answer: That's not really a question, but we couldn't agree more. In fact, Mr. Rogers had 25 sweaters on the show that were all hand knit by his mother.